This page contains content of an adult nature that may be unsuitable for minors. If you wish to view such content and are allowed to do so, please type "I agree" in the field below. Otherwise, any adult images will remain hidden. A man lays quietly out in forest, the moonlight whispering through the tree branches. He turns his head toward a cabin on the hill. Getting up from his peaceful-looking position, he heads over to check it out. Inside, he spies evidence of a struggle. 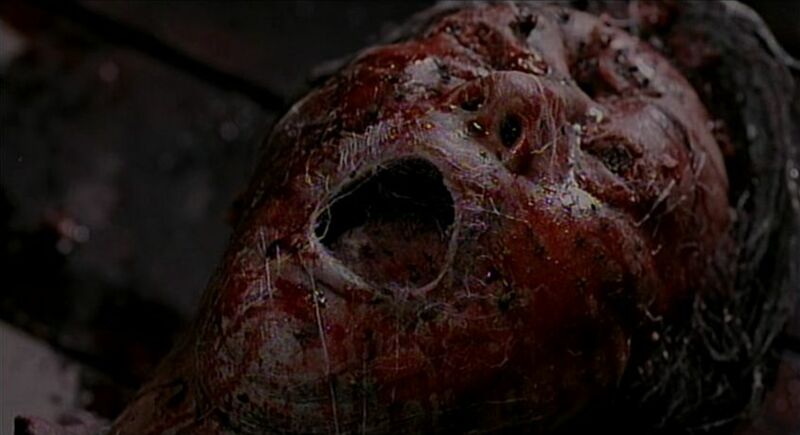 Broken glass is scattered around the room... and then a gruesome discovery pans into view... the body of some dead dude sprawled out on the floor, covered in blood. Truly a shocking sight for anyone to see, but he pushes on, making his way to the bedroom. 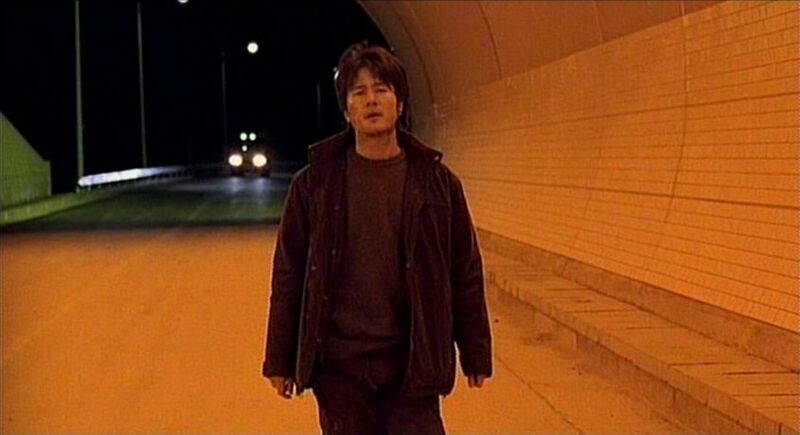 There he finds a woman, a woman that he obviously recognizes, as he runs over to her crying out her name... Su-young! Su-young! It appears that she is still alive... but just barely... and not for much longer. Then he hears something. Grabbing a nearby garden tool, he throws open a door only to see someone who quickly takes off running. Now, when he first opened the door, I thought he was actually looking into a mirror, because the guy who took off looked to have the exact same jacket. In fact, the only way I could tell the two people apart during their ensuing chase was that one guy had the garden tool and the other didn't. Unfortunately, our guy doesn't catch his man... in fact, his man catches him by sneaking around behind him and smacking him square in the head with a big piece of wood, and not just once, but twice, knocking our man out cold. When our guy awakens, he makes his way through the trees until he comes upon a road, running through a beautiful tunnel made orange by the tint of the lights along the top. Staggering into the tunnel, he is suddenly struck by an SUV and is thrown into the air like a rag-doll before coming to rest on the hard pavement. Had another vehicle not come by soon after, he would have died there. 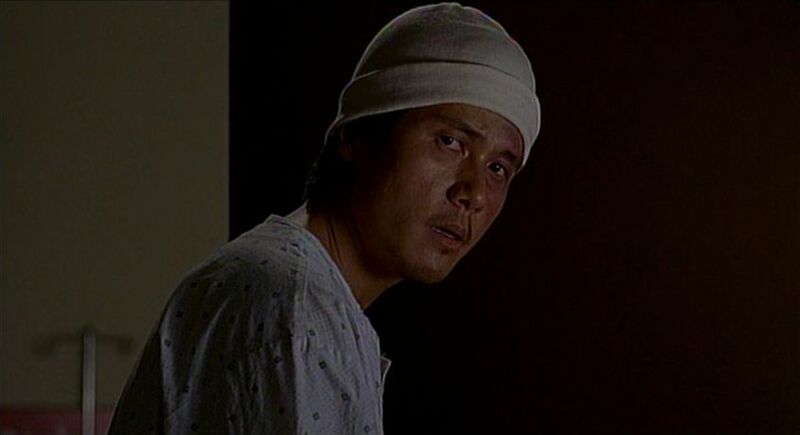 Instead, we quickly find him in an operating room with doctors working frantically to stabilize him. Of course they succeed, I mean, it'd be a pretty short movie if they didn't, but fourteen days pass by before our guy regains consciousness. I still have to call him "our guy" because up until this point, nobody knows who he is yet. The dude that laid a smack-down in the forest took his wallet, and the only thing left in his pocket was the picture of some chick holding two ice cream cones. Mmmm... ice cream... hold on a sec... okay, now that I got me some ice cream, we can continue. 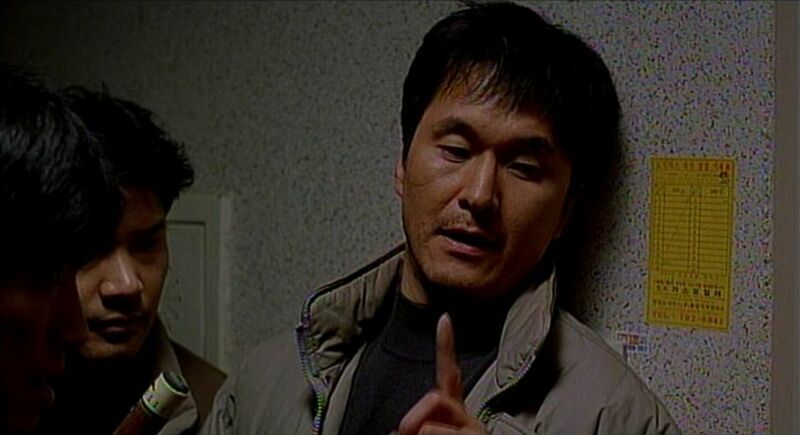 The guy's first friend to come visit is a cop named Sung-Hyun Choi. He finally reveals our guy's name to us, which is Kang Min. 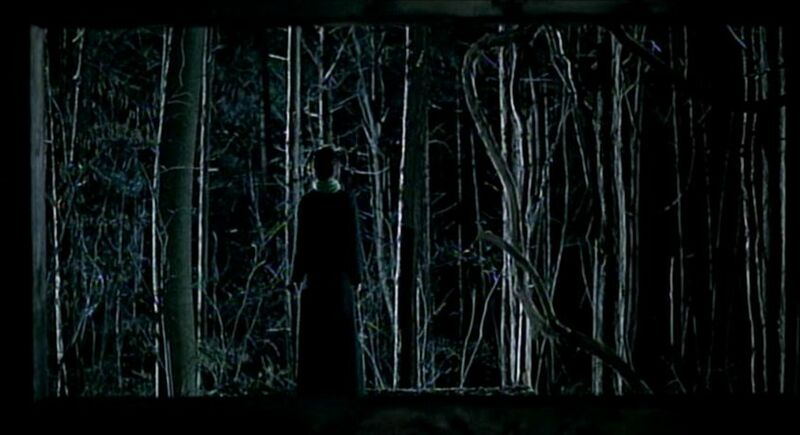 So Min tells Sung-Hyun about the dead people in Spider Forest... though not in so many words. Due to his trauma, he talks more like Frankenstein's Monster at this point. 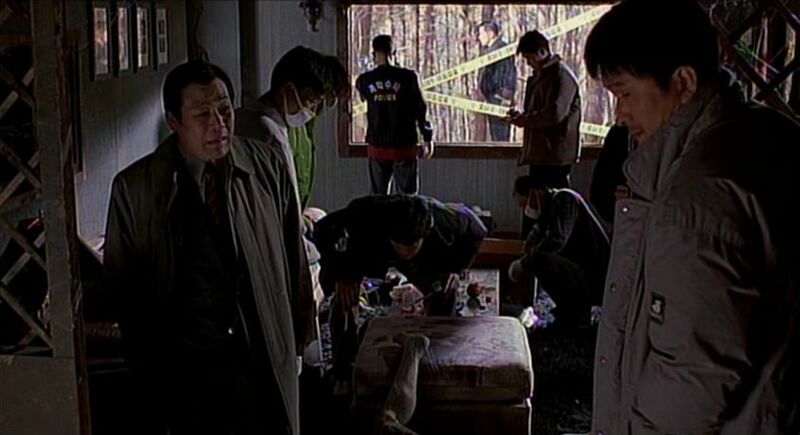 At any rate, Sung-Hyun goes to check it out, and sure enough he finds the two bodies, covered in cobwebs and crawling with spiders. Ewww... creepy. At least they know who the dead folks are now. The dude is Choi Jong-pil, age 46 and the managing director at IBS, a television station. Then the chick is Hwang Su-young, age 27 and a reporter at the same TV station. 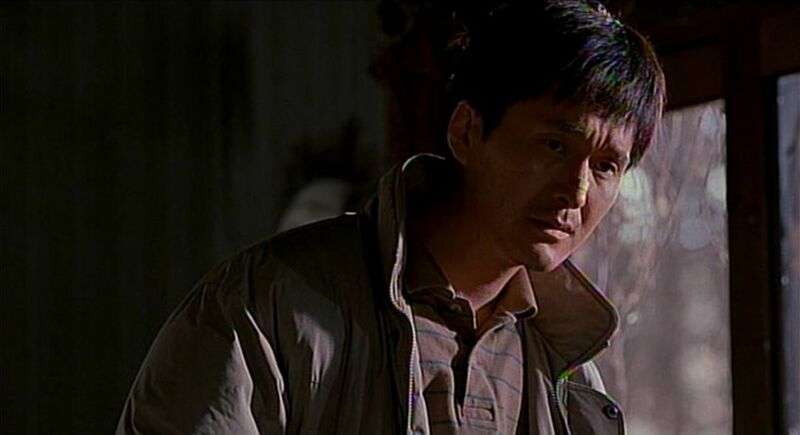 Now, Su-young while Su-young was found to have three stab wounds, Jong-pil was found to have 40... so obviously somebody was a little ticked off at him. Remember how Min recognized Su-young? Well, apparently she was his girlfriend. Hmmm, his girlfriend, alone in a cabin with another man, and Min just so coincidentally happens to be hanging right outside... and then chasing a guy who looks like he's wearing the exact same clothes... kinds of suspicious don't ya think? If I had to guess, I'd say he killed them both, went outside, and had a mental breakdown. And hey, that's one of the thoughts the detectives have, except if he did kill them, why wouldn't he hide the bodies? 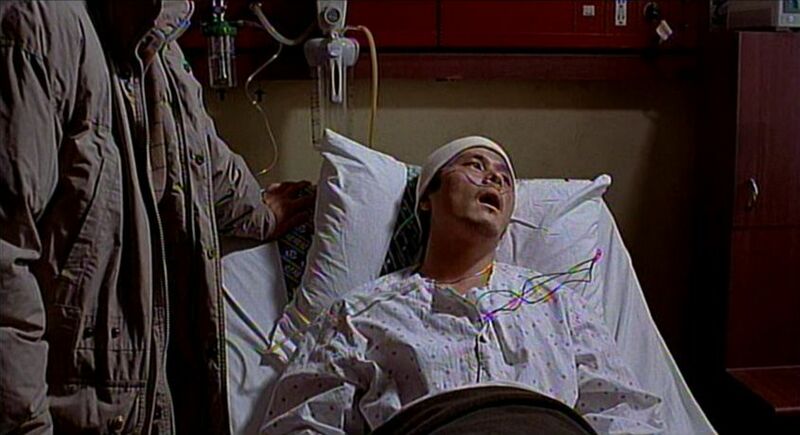 And why would he confess to the crime as soon as he wakes from his coma? And if he didn't do it, then why was he even there? And who was he chasing? Open-and-shut is one thing this case is not. 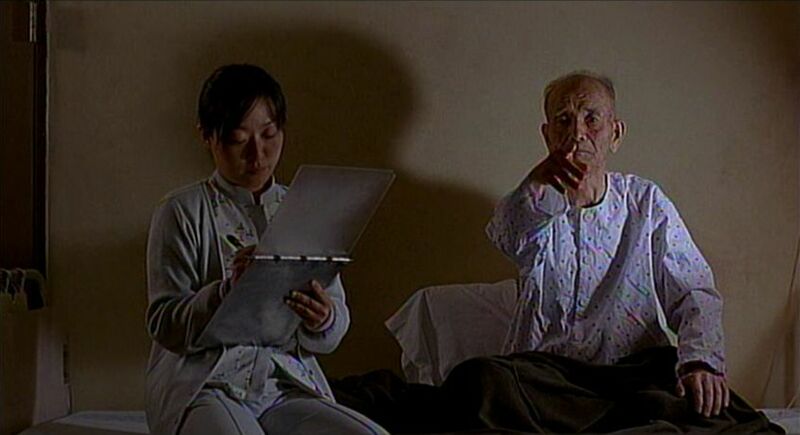 Like most of Tartan's Asia Extreme releases, this film has a nice sense of atmosphere. Like I've mentioned in other Asia Extreme reviews, you really don't even have to know what's going on to enjoy watching it, and I'm actually thinking that's how they pick out which movies they would like to release, just by watching the original flick without subtitles or translation, just getting the feel of the movie. I mean, if it's enjoyable when you don't know what's going on, odds are you're going to like it even more when you do know what's going on. And with this DVD release, you get deleted scenes, behind the scenes, and various interviews, which is what we've come to expect from Tartan Video. They're pretty good about doing quality releases. 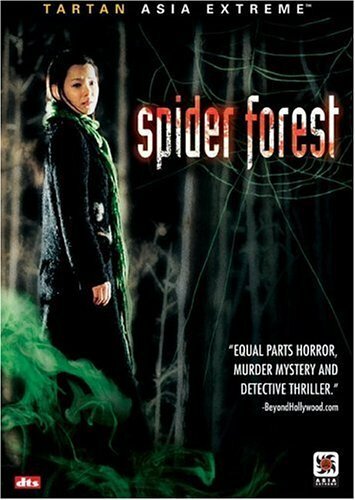 Spider Forest was released by Tartan Asia Extreme on DVD on October 25, 2005. 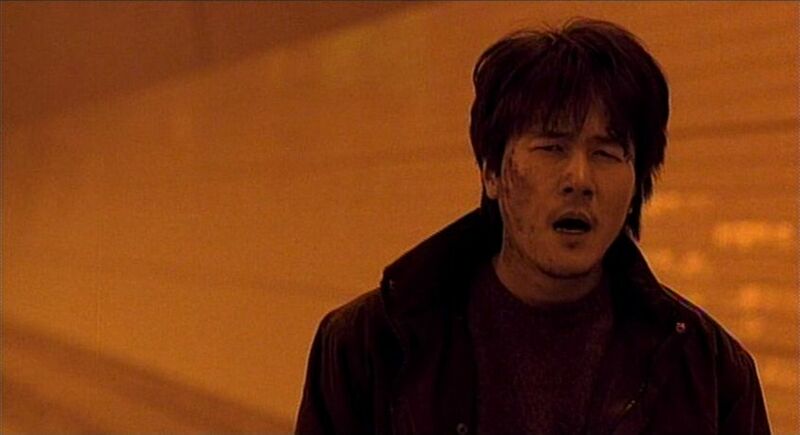 It was written and directed by Song Il-gon, and stars Gam Woo-sung as Kang Min. The above content came from yours truly (contact me). The above content came from yours truly.